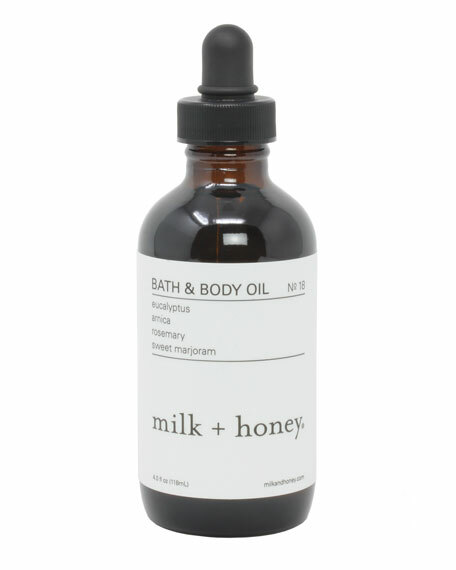 milk + honey Bath & Body Oil No. 18, 4.0 oz. milk + honeyBath & Body Oil No. 18, 4.0 oz. Relief. Let this powerhouse bath and body oil fight the good fight for you. Arnica, eucalyptus, and other essential oils feel amazing on sore joints and muscles while delighting your senses. Place two to three full droppers into a hot bath. Towel off and apply a few drops on your hands, then distribute to legs, arms, torso, or anywhere you'd like some extra hydration. Massage directly on joints and muscles. 118 mL/ 4.0 fl. oz. For in-store inquiries, use sku #2300805.